A new identity and name for Access, Diamond bank will emerge in the next six to eight weeks, the banks have said. Naija News reports that the Executive Director Personal Banking of Access Bank Plc, Victor Etuokwu, made this known during a press briefing at Access Bank headquarters in Victoria Island, Lagos Nigeria on Monday evening. Giving reasons for the merger, Etuokwu said the banks came together in order to provide a better deal for the consumers, noting that Access bank wholesale ability and Diamond bank retail ability will make the new enlarged entity the best in the country. Asked what will be the identity of the new bank, Etuokwu said: “It’s a merger, that’s the first one, it’s a merger and two, because a bank took some strategic position of pulling out from the international unit does not mean there is something wrong with it”, referring to Diamond bank. “There a bank in Nigeria here that has done that kind of thing, WEMA. In the past WEMA was a much bigger bank, it became a small national bank. It’s all strategic. That means that banks and brands will always do things that will put them ahead, okay”! 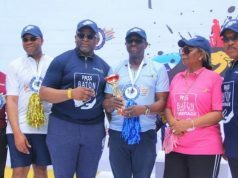 The Access bank Executive Director continued: “What we have done is a merger of two great brands coming together for the benefit of the consumer. Access bank as you have always known us, we have been a wholesale bank, but after 2012 after the merger with Intercontinental, we begin to do some retail but we know that is not our strength and Diamond bank know the strength they have, so we have come together to complement each other and to create a bank that will have robust strength for both the wholesale market and the retail market. “So, it’s a merger, coming together of two Nigeria’s great banks to create value for consumers, that’s what it is. “For the last one month we have been going around the country and people have asked this question and we have given them one response. What is important is the identity of the new enlarged bank. The identity of the enlarged bank will reflect the strength of Access bank and the strength of Diamond bank. “If you come into the bank of the enlarged entity, you will know that Diamond is inside this bank and Access bank. If you are a corporate it will appeal to you, if you are retail it will appeal to you, that’s what we have. “We have the best bank consultants working on it to ensure that the identity of the new enlarged entity has the best identities of both banks, so name is always part of our identity, there is more to our identity than just name, so I don’t think that we should be too focused on the name but virtually it is and that will be clear in the next six to eight weeks. When you work into a branch, you will know that this is Access and this is Diamond”.